Preparatory sketches for The Floating Piers The first visitors flock over the completed piers, Saturday 18 June. Crowds outside TASCHEN’s pop-up store at Lago d’Iseo. Christo on location of The Floating Piers, Lago d’Iseo. 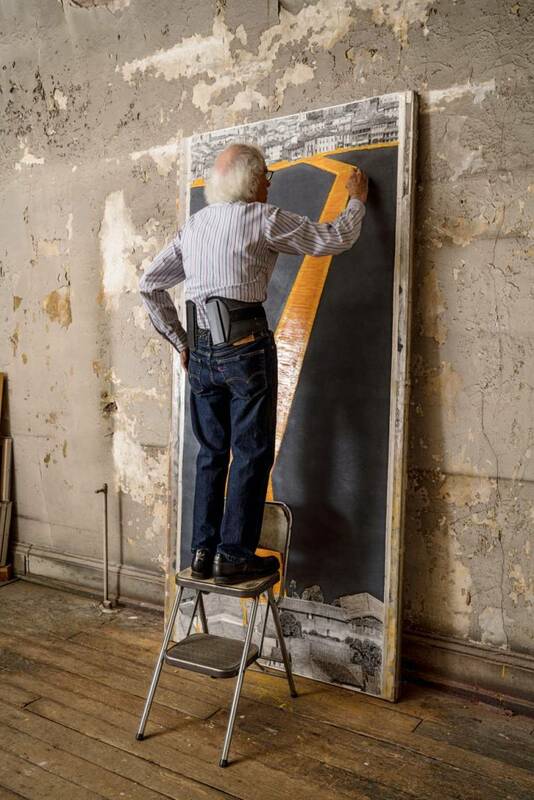 Christo in his studio working on a preparatory drawing for The Floating Piers, New York, November 2015. 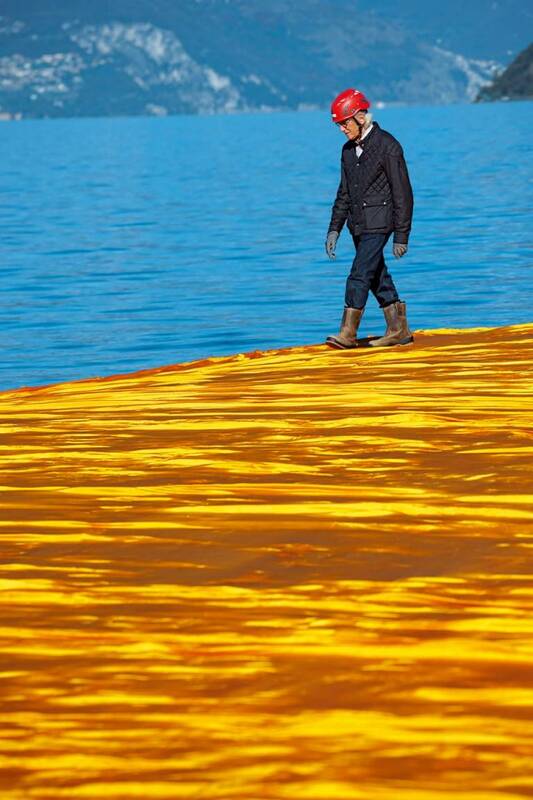 Christo on location of The Floating Piers, Lago d’Iseo. 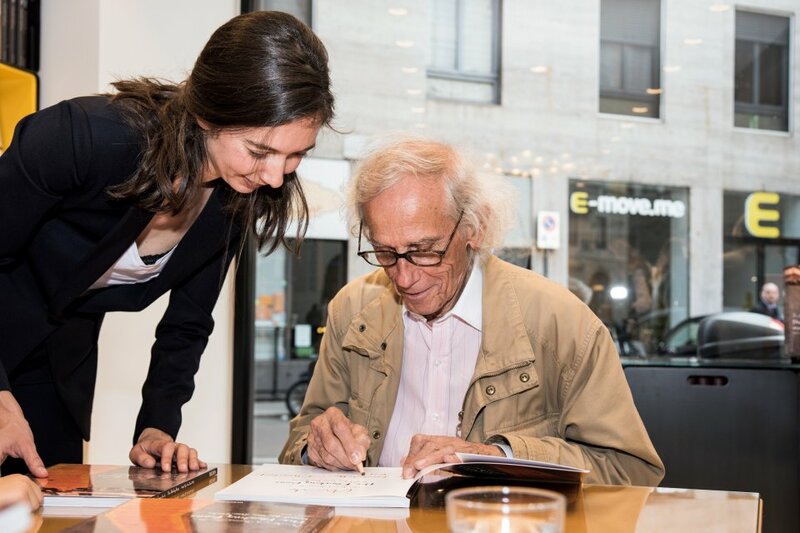 Christo with Marlene Taschen at TASCHEN Store Milan book signing, May 2016. 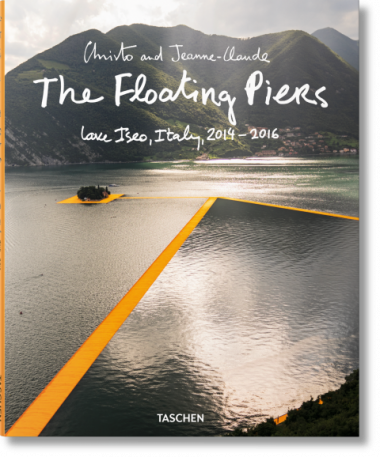 As The Floating Piers opens at Lago d'Iseo, Italy, Christo talks to TASCHEN’s Eliza Apperly about the realization of a waterborne dream. Lake Iseo in Northern Italy is not as well known as its Como cousin across the mountains. It is slightly smaller, a little quieter, with fewer celebrity residences dotted along its shores. 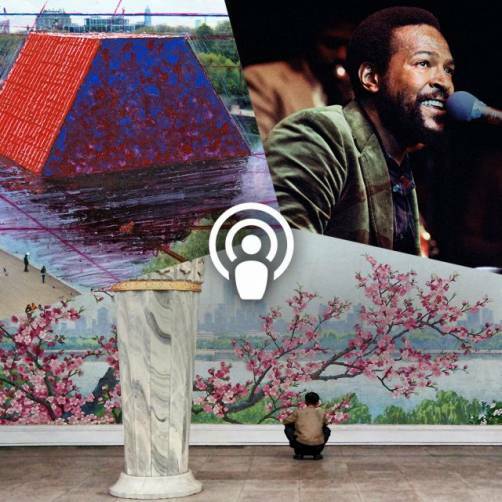 This summer, however, the cerulean expanse 100 kilometers east of Milan and 200 kilometers west of Venice will host one of the art events of the century. 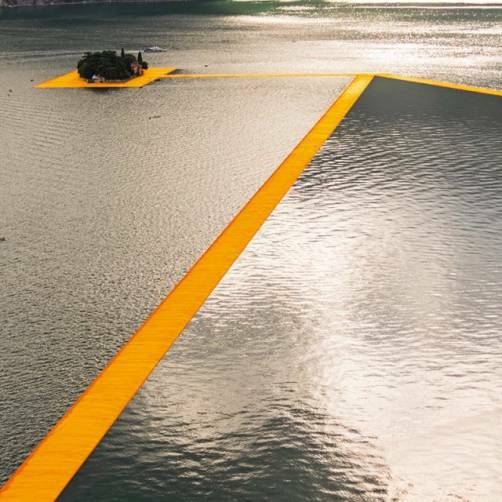 Between June 18 and July 3, 2016 Christo and Jeanne-Claude’s The Floating Piers will extend a 3-kilometer yellow fabric walkway from Iseo’s lakeside settlements of Peschiera and Sulzano across to the soaring island of Monte Isola and its diminutive island neighbor, San Paolo. 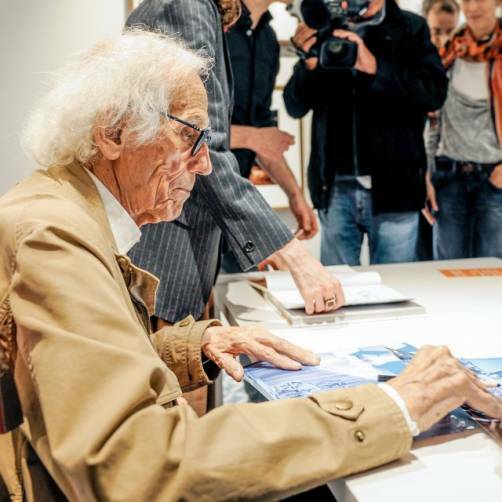 In 2014, five years after Jeanne-Claude died, Christo was driving through Northern Italy and scouted Lake Iseo. As well as its pristine setting and crystal waters, the lake’s 400-meter high Monte Isola (Mountain Island) is the tallest freshwater island in Europe. “It’s as tall as a Manhattan skyscraper!” marvels Christo. He decided to give the project another go. The project was announced in April 2015 and Lake Iseo became a hive of activity. Trucks shuttled the pier’s floating cubes from production plants to the project headquarters at Montecolino. Some 100,000 square meters of yellow fabric and laser-cut PVC strips were sewn together into panels. Pier sections were bolted together, with steel insert triangles allowing for gentle curves in the walkway's path. And 190 anchors weighing five tons were installed to secure the piers to the lake bed, some 270 meters down at the deepest point. 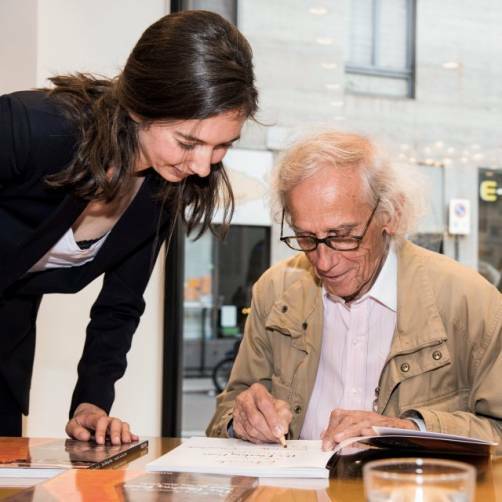 Register your interest in Christo’s The Floating Piers Collector’s Edition (available Spring 2017) via collectors@taschen.com.